In 2008, I started compiling a unique Christmas playlist, a festive mixtape that would refresh my holiday jingle list. I sought to exclude cartoon character musicians, the boy band holiday left overs from the 90's, and the popular, but abused and worn out Christmas music staples -- think Amy Grant, or even Frank Sinatra. I was hoping to create an assortment of different spins on the classic Christmas ditties we have grown up with. Over the years I've collected hundreds of mostly unheard, or unpopular Christmas songs from big names like The Killers, Coldplay, She & Him, and even the smaller singer/songwriters like Sufjan Stevens, and Maria Taylor. My list grew larger than my waistline around this holiday season. So this year I've reorganized, and sharpened my selections to include only the BEST. The result is TWO playlists. The first, which I'm posting today, is an all Indie Christmas selection, songs from the little guys, the 'lesser knowns'. In a few days I will post the second playlist, the holiday jams from the larger acts, but songs that you probably haven't heard. So here's to venturing out of our Josh Groban comfort zones, and escaping the trendy trappings of American Idol Christmas tuneage. Rejoice, there are other Christmas musical offerings that can thrust us into this winter season. Peep the music player at the end of the tracklist. And let me know what you think in the comments or if you have a suggestion to add to the list. 1. Holly Jolly Christmas | The Format - Before he was having FUN, Nate led the beloved Arizona band, The Format. They turn this song into an upbeat ear-tickler. 2. Carol Of The Bells | The Bird And The Bee - This song is one of my two favorite Christmas hymns. And this whispy, restrained version is all sorts of beautiful. 3. The Little Drummer Boy | Sufjan Stevens - Nobody making music these days loves Christmas music more than Mr. Stevens. The dude has released a walloping 100 holiday themed jams. This one is one of his classics. 4. Christmas After All | Maria Taylor - I discovered this song last week and it's quickly becoming one of my favorites. It sounds like Christmas, but the songwriting is its' own. Oh Maria, you have my heart. 5. All That I Want | The Weepies - The duo behind the perfect song 'world spins madly on' creates a holiday longing in all of us with this jam. 6. Silent Night | Priscilla Ahn - A song more popular than the pope. How do you make it different? Layered voices. Ohhhhh myyyyyyyy. 7. Christmas Song | Stars - These guys have a few Christmas songs out and this one always made me wish it snowed here in our dusty desert. 8. Happy Xmas (War Is Over) | The Polyphonic Spree - Apparently this band has been known to play Christmas music in July, they adore it so much. They just released their first Christmas album this year, and it's some of the most wild, adventurous, inventive spins on the popular Christmas songs we love. This particular one has a child choir. Epic. 9. Jingle Bell Rock | Rogue Wave - Weirdly awesome voices get you fresh takes on the dated classics. This one is just sweet. 10. Do You Hear What I Hear | Copeland - Another band that is no mas. But they left us with a lovely spin on a song that asks us all a question. 11. Have Yourself A Merry Little Christmas | Bright Eyes - My sister dubbed this 'the most depressing Christmas song' she's ever heard. Which is hilarious. And appalling. I find this to be a supremely intimate take on "Have Yourself A Merry Little Christmas", and Connor's voice gives me the chills once in awhile on this quiet track. 12. Oh Come Oh Come Emmanuel | Joshua James - A sturdy and organic sounding take on a beautiful and overlooked Christmas single. 13. Angels We Have Heard On High | Sufjan Stevens - The song that kids love to sing gets a wildly fun twist with Christmas confidante, Sufjan Stevens. It's different, and it's awesome. 14. Redribbon Foxes | A Fine Frenzy - Beautiful singer/songwriter released a Christmas EP a few years ago. Shame on me for just discovering this and depriving my ears. This is an original song. 15. December | Regina Spektor - Another creative original song, and possibly the song that feels the least like Christmas music on this list. But man, the playfulness and the strangeness in her songwriting is always worth listening to. 16. O Holy Night | Dustin Kensrue - Thrice frontman sings my favorite Christmas hymn. What a pinnacle. 17. Santa Claus Is Coming To Town | Mason Jennings - A simple, but yet satisfying version of a childhood favorite. Thank you, Mason. 18. Wonderful Christmastime | The Shins - A newly released single from Indie's fav. Is it time to dance? 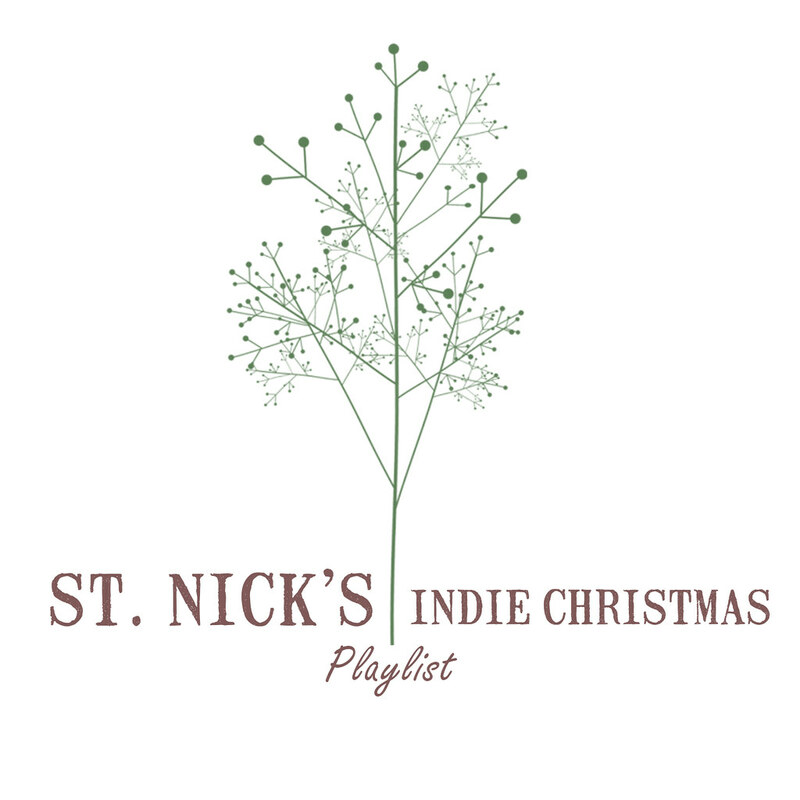 St. Nick's Indie Christmas Playlist from nickspud16 on 8tracks Radio.